This print, acquired directly from the collection of the photographer, is the unique original which served as a master via a copy negative for all later printings of this image. Close examination reveals the discreet intervention of the retoucher who has shaped the model's waist on the original negative and subsequently with deft strokes on the print itself. When the image was eventually published in Vogue, further retouching, exceuted presumably either on the negative or by the plate-maker, brought the left side of the corset tight to the model's torso. The stamps and annotations on the reverse of the present print confirm the specific date of the shoot as August 11 1939 with the model Mademoiselle Bernon. The image would have been published full-page but the outbreak of war and its consequent restrictions put a severe limitation on Vogue. Neither the October nor the November issue was published. 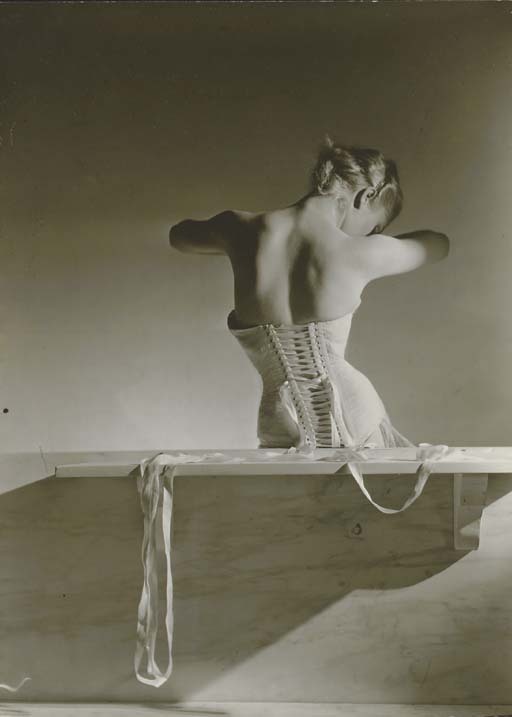 Horst's Mainbocher Corset image eventually appeared in the last issue of the year within a feature that presented the originally intended spreads as a collage. This study, made on the eve of the Second World War and distilling Horst's unique eye for elegance, has become his best known image and is universally recognized as an icon of its era.